PEJIC, D. , GAZIVODA, N. , LICINA, B. , UREKAR, M. , SOVILJ, P. , VUJICIC, B. This paper presents a proposal of a new way to generate analog noise, discrete in time, with uniform probability density function. 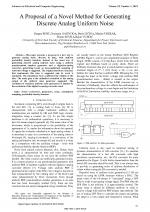 Instead of the usual way of generating discrete analog uniform noise using a uniform pseudorandom number generator and a digital-to-analog converter, generating based on non-equidistant sampling of sawtooth voltage is suggested. The original hardware structure that implements this idea is suggested and its work is simulated. The simulations have confirmed the validity of the idea. The main gain is the unlimited resolution of the analog output of the uniform noise generator suggested. The resolution of standard uniform noise generators is limited by the resolution of the digital-to-analog converter used. A. Alaghi and J. P. Hayes "On the functions realized by stochastic computing circuits", Proc. Great Lakes Symp. VLSI, pp. 311-336, 2015. V. Canals et al., "A new stochastic computing methodology for efficient neural network implementation", IEEE Trans. Neural Networks and Learning Systems, 2015. T. H. Chen and J. P. Hayes, "Analyzing and controlling accuracy in stochastic circuits", Proc. ICCD, pp. 367-373, 2014. N. Onizawa et al., "Analog-to-stochastic converter using magnetic-tunnel junction devices", Proc. NANOARCH, pp. 59-64, 2014. M. Urekar, D. Pejic, V. Vujicic, S. Avramov-Zamurovic, "Accuracy improvement of the stochastic digital electrical energy meter", Measurement: Journal of the International Measurement Confederation, 98, 139-150., 2017. R. E. Best, "Phase locked loop: Design, simulation and applications", 4th ed., New York: McGraw-hill, 1999. R. Manohar, "Comparing stochastic and deterministic computing", Computer Architecture Letters, 2015. 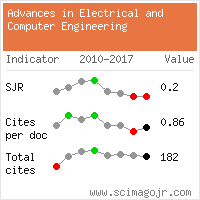 Citations for references updated on 2019-04-19 06:40 in 82 seconds.